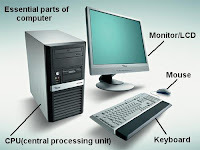 Check out the picture below of four basic desktop compute parts. Next, open up ABCya Paint and draw four computer parts. Use the text tool to label your computer parts.